This page is dual purpose; it's about making a sledge hammer handle, and, what I call speed adze. This is my first try at making a handle, there are web articles by much more experienced people; this is to encourage beginners, show pictures, and entertain old timers. In the first picture, you see from bottom to top, the broken hammer and handle, above that is the Hickory half log; it has already been split once. Above the Hickory are two steel wedges, and a working sledge hammer. In the next picture, I've split the log again. The next step is where the foot adze comes in. My table saw is a good old one, but the ten inch blade only cuts through wood so thick. The adze makes it thinner, and puts a flatter edge on one side, which makes it easier and safer to run through the table saw. In the next picture, there are three beams laying on the ground. Two are for standing on, to put me at the same height as the work. The middle beam holds the work; that's where the “speed adze” takes place. I don't claim to have invented this, I can imagine some guy back in the 1700's doing this, and, there's probably a you tube video out there showing the same thing. I wouldn't know, as I'm on dial up, and videos are out of the question. Anyway, this third picture is hard to explain and interpret, so I made a drawing. In it you see the middle beam, which holds the work, it's labeled A. B is the Hickory wood. C is a rope loop, there are two of these. D is the twisting stick, there are two of these as well, and two of E, the securing bolts. I've done this speed adze thing twice now, once with the loops around the wood itself, and once with the loops around a bolt in each end of the Hickory wood. That's what bolt F is. That's actually worth the time if you're making four sides flat. 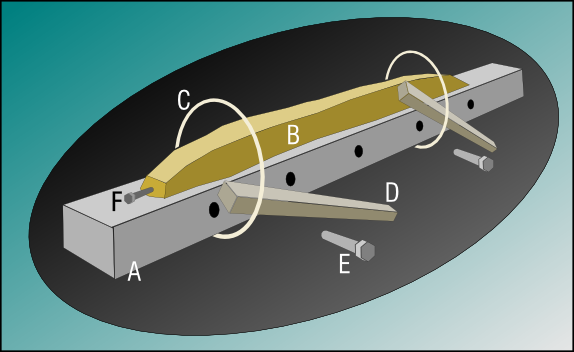 In that method, the loops go around the F bolts, not the B wood itself. What you do is very simple, you probably can already see it; you put the whole thing together as you see it in the drawing. Then you twist the D sticks in a circular motion until the rope loops are tight, holding the B wood firmly against the A wood. Then you put the E bolts into the holes in A wood, to keep the D sticks from unwinding. You lay the whole assembly with B wood up where you can shape it with the adze. I call this speed adze because without it, the wood moves around; and you spend more time positioning the work piece. In the next picture you see the Hickory wood after I made a cut lengthwise through it. The picture after that shows the trimmings laying on the porch. This was a turning point for the project. These pieces broke way too easily by hand, this wood laid out on the forest floor too long. The outer part of the wood had deteriorated. I decided to finish the project anyway, just to see how well the other steps would go. The next step is to put the selected piece in what I call “shave beam” . The tool pictured is called a drawknife. I used it to round the corners. I also used the drawknife to fit the handle to the hammer head. The last picture shows the hammer after splitting a piece of Southern Yellow Pine with a steel wedge. I thought it would break on the first piece of wood, but it did several more, oh well, maybe it'll last a month.